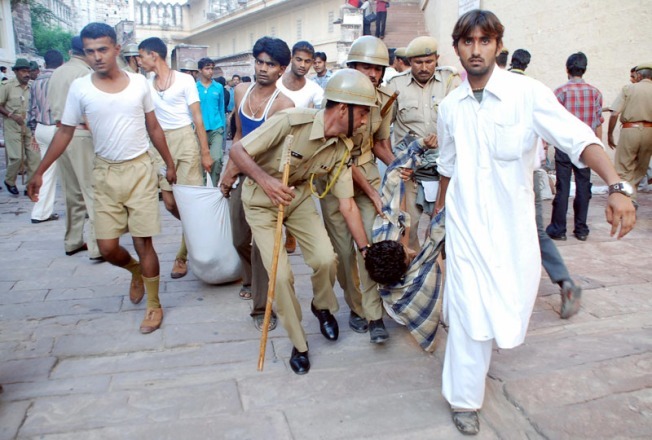 Indian police and volunteers carry injured people following a stampede at a Hindu Temple in Jodhpur on Tuesday, September 30. Over 150 people were killed and scores injured in a massive stampede at a Hindu temple in the western state of Rajasthan, a senior state official said. NEW DELHI –– Pilgrims stampeded a Hindu temple Tuesday in the historic town of Jaipur, killing at least 100 people and injuring many more, according to media reports. Severe overcrowding apparently caused the crush as more than 12,000 people gathered at the temple to celebrate a Hindu festival, Jodhpur Police Superintendent Malini Agarwal said. The death toll was as high as 125 people, according to some media reports. Television footage showed dozens of bodies lying on the sidewalk, while nearby frantic people tried to revive unconscious devotees, slapping their faces and pressing on their chests. Others dragged people by their arms and legs, running down a ramp that leads to the temple inside the massive 15th century Mehrangarh fort that overlooks the town. One child sat on the ground next to the body of a woman, rubbing her forehead and crying "mother, mother." Thousands had gathered at the temple at dawn Tuesday to mark the first day of Navratra, a nine-day Hindu festival to honor the Mother Goddess.